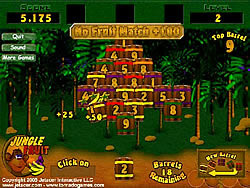 Jungle Fruit Game - FunGames.com - Play fun free games. Come to the Jungle and take on the fruits of nature. fun game play is simple but to become the King of the Jungle on the high score list it is going to take a fun game roar of skill. Battle your way through stacks of barrels to release the fruit to achieve the best score.The fun game has a fun game built in tutor to help you learn how to play.